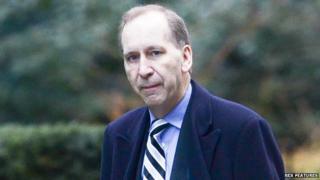 A former senior adviser to the prime minister has been charged by police over child abuse images. Patrick Rock was arrested at his home in London in February after Downing Street officials contacted officers. The 63-year-old was questioned by investigators from the newly formed National Crime Agency. Mr Rock was deputy head of David Cameron's policy unit at the time of his arrest and they have known each other since the late 1990s. They worked together as special advisers. In a statement, the National Crime Agency described Mr Rock as a "Whitehall adviser". It said he had been bailed to appear at Westminster Magistrates' Court on 3 July. He has been charged with three counts of making indecent photographs of children and of possession of 59 indecent images of children. The images have been assessed by Child Exploitation and Online Protection (CEOP) officers and CPS lawyers as meeting the definition of level C - the lowest category. Judith Reed, a senior lawyer with the CPS organised crime division, said: "The decision to prosecute has been taken in accordance with the Code for Crown Prosecutors. "We have determined that there is sufficient evidence for a realistic prospect of conviction and that a prosecution is in the public interest. "May I remind all concerned that Mr Rock has a right to a fair trial. It is extremely important that there should be no reporting, commentary or sharing of information online which could in any way prejudice these proceedings." Police searched offices and computers in Downing Street as part of their investigation. The arrest was not made public until details were published in a newspaper three weeks later. Mr Rock failed to win a seat in Parliament on three separate occasions in the late 1970s and early 1980s.